Wasps have a distinct head with chewing mouth parts, short elbowed antennae, and large compound eyes. The thorax and abdomen are marked with yellow, red or brown on a black background. 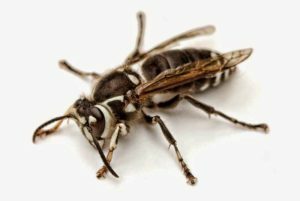 The wasps have four clear or smoky brown wings and a long stinger. Yellow jackets are usually marked with bright yellow and black patterns and are about 3/8 to 5/8 inches long. The baldfaced hornet is similar in appearance except that is white and black and 5/8 to 3/4 inch long. Paper wasps are marked with yellow, brown or red patterns on black and are 5/8 to 3/4 inch long. Social wasps have large nests containing three types of individuals, or castes: queens, workers, and males. Eggs are laid in the cells of the nest, and the young larvae are fed bits of chewed up meat or insect parts by the queen and later by the workers. Yellow jackets and hornets build flat paper nests in stacks which are then surrounded by a paper envelope. Yellow jackets usually build their nests below ground and in other [protected locations. Baldfaced hornets prefer to build their nests in trees and on the sides of buildings. Paper wasps build open flat nests, without a paper envelope, usually under the eaves of a house and in other protected locations. Social wasps use their nests only one season. The colonies can contain as many as 30,000 individuals. These insects are considered to be beneficial because they feed their young a variety of insects. They become a nuisance when they build nests in or near structures frequented by humans. It is helpful to determine where the nesting area is located but it is recommended to contact a pest control company to treat and remove the nest since these nests can be quite large.